Why is it voice-over narration is considered by many so-called experts to be incongruous with the true nature of cinematic storytelling; hence screenwriting? Script doctors and other gurus continue to castigate the technique and have for decades. When well written and properly used, the voice-over has enhanced the dramatic impact of so many wonderful movies from DOUBLE INDEMNITY to TAXI DRIVER to THE SHAWSHANK REDMEPTION to FORREST GUMP to FIGHT CLUB to AMERICAN BEAUTY to MOMENTO and on and on. I can’t imagine any of these movies without their voice-over narrative. I’ve read that the problem is there are so many screenplays where the voice-over is improperly used that script readers and script doctors cringe whenever they open a script and see it right there on page one. Typically VO is used when the screenwriter is adapting source material like a novel and in particular material written in a first-person narration. It’s incredibly hard to be loyal to such material without voice-over. Think about Chuck Palahniuk’s novel Fight Club or Stephen King’s novella Rita Hayworth and the Shawshank Redemption, both source materials pretty much required voice-over to tell the story properly. Therefore I don’t necessarily agree with the rule that you should be able to remove VO and the story isn’t impacted. I don’t think FIGHT CLUB or THE SHAWSHANK REDEMPTION would resonate and have the same dramatic impact without the voice-over. Red’s “I Hope” monologue at the end of SHAWSHANK is one of the best examples of a well-written and emotionally impacting VO. Same thing with Forrest Gump’s “Destiny” monologue and so many other movies where the voice-over is used with such dramatic force. The only thing I will say about voiceover is this: If you can show it without telling us about it, then don’t use voice-over. Additionally, voice-over should be used while we are visually experiencing something related to the narrative. But that’s all I have to say about that, to quote Forrest Gump. First up is MOMENTO. I don't think you can remove the voiceover without its absence impacting the narrative and the dramatic effect of the story. In this clip at the 3:50 mark is the "I'm Chasing this guy. 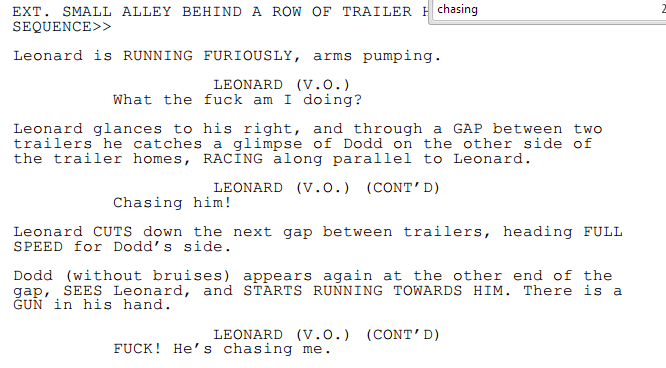 NO he's chasing me" scene. I selected this scene because its funny. If you watch the movie and read the script you get a great feel for how powerful VO narration can be. To read the entire script, click here.